While, like with most book lovers, it is impossible for me to pinpoint my favorite author, Margaret Atwood definitely hovers around that #1 spot. My first introduction to Atwood was my junior year of high school, when I read The Handmaid’s Tale. That book basically blew my mind, and I knew I wanted to read more of her work. Though I unfortunately have not actually gotten to read very many more of her books, I follow her on Twitter, where she is very active, and read her blog posts. One of my favorite things about Atwood is that she is an activist at heart; she stands up for what she believes in, both through her writing and her actions. As an example, a few weeks ago she signed a petition against Fox News expanding into Canada, a signature that was met with a scathing attack from a Canadian newspaper. Instead of hiding from the public or retracting her signature, she upheld her signature and kept her fans updated on everything that was happening and her opinions on it. Despite being very busy flying around the world as part of her book tour for her most recent book, The Year of the Flood (a companion novel to her 2003 Oryx and Crake), she still constantly fights for social justice and the environment, and interacts with those who admire her. 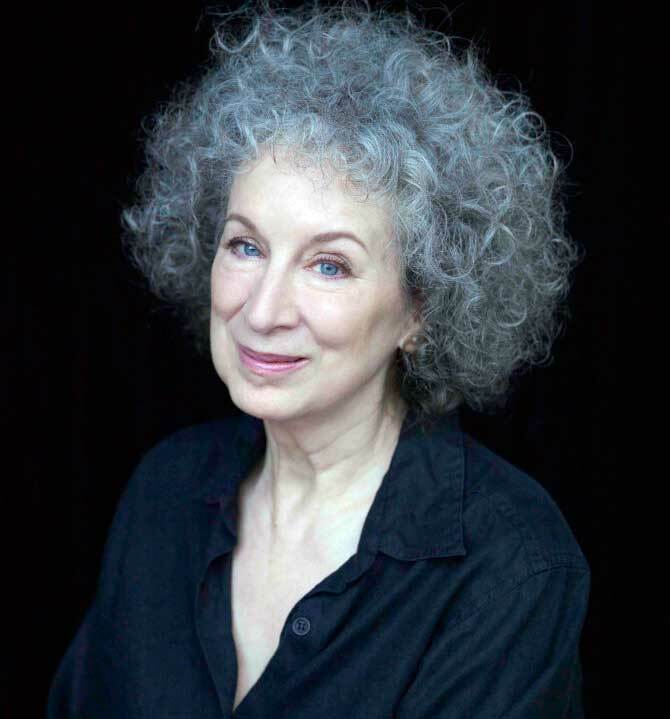 Recently, in fact, Atwood participated in a Goodreads Q&A group, in which fans asked her all sorts of questions about her books (particularly Oryx and Crake, The Year of the Flood, and The Handmaid’s Tale), her writing habits, and writing and literature in general. While much of the discussion would provide many spoilers to someone who hasn’t read the novels, I’ve selected some (spoiler-free) questions and answers that I found pinteresting. 1) Literary: As a young person, I was disturbed when the characters in books never got anything to eat, or when they were actually starving or going hungry, as in Oliver Twist and Les Miserables. Also I read a lot of animal stories and food is very important in them. So I try to give my characters something to eat when possible. 2) Real life: I was young during the war when there was rationing; people thought a lot about food, what was scarce, etc. And I spent much of my childhood in the northern bush — we had a garden (no shops nearby) and caught fish, etc. So I have always known where food comes from. I have known about wild foods all my life and have prepared and eaten many. (I raised the money to start PEN Canada by writing a book called “The CanLit Food Book,” which juxtaposes fiction bits and poems about food with recipes by authors - some of whom can’t really cook... There’s a recipe for “toast,” for instance.) In the 70s we lived on a farm and had chickens and other animals and a huge vegetable garden, & did a lot of canning, drying, preserving etc. If you’d like to see Atwood’s other responses, including some interesting answers to specific questions about her novels, you can check out the group here. I've read Cat's Eye and really enjoyed it. I actually own Alias Grace and The Handmaid's Tale but haven't read them yet! Awesome snapshot! I can't wait until I read more from her! So exciting to your feature on Atwood. I could't get enough of her in college. If you haven't read it yet, check out Surfacing. I can't wait to read your review of Wilderness Tips. I've read most of the stories and it will be interesting to read what you have to say. Surfacing is a great book. I read it shortly after The Handmaid's Tale (my favourite Atwood). She has so many books, I don't know if I'll ever read them all. I've read Oryx and Crake and I'm eager to dive into Year of The Flood. What a great snapshot! I've read Handmaid's Tale and Penelopiad, plus listened to Oryx and Crake and The Year of the Flood (both awesome recordings). I've been hoping to read more of her work soon! I absolutely adore Margaret Atwood. The Handmaid's Tale blew my mind as well ... from there I read The Blind Assassin and Surfacing. AMAZING stuff. It's hard to say but I think Surfacing may have been my favorite. Wonderful post! Margaret Atwood is one of my favorite authors!! I love Margaret Atwood too - The Handmaid's Tale is probably my favourite but I also loved Penelopiad. I read Oryx and Crake and I was really really impressed. I love the story and it spoke to me on different levels. Now that I know that Year of the Flood is almost a sequel to that one I would look out for it too. I have seen Atwood twice at readings for The Year of the Flood (she sang for us at one of them!). She is terribly funny, very witty and super smart. Oh and she's also a great writer. Reading your post made me smile. Ahh Jen I'm so envious! Last year I kept being on the wrong side of the country to see Atwood...when she was in Seattle (where I'm from), I was across the country at school, and when she was in upstate NY (where I go to school), I was back home. It seems like a lot of people loved Surfacing -- I'll definitely have to read that!